Who is eligible to be honored? Anyone who has served honorably in the armed forces or is currently on active duty. The Walk also is currently constructing a new section that will honor anyone who is a member of any organized law enforcement agency, fire and rescue service, emergency medical service or other emergency organization. 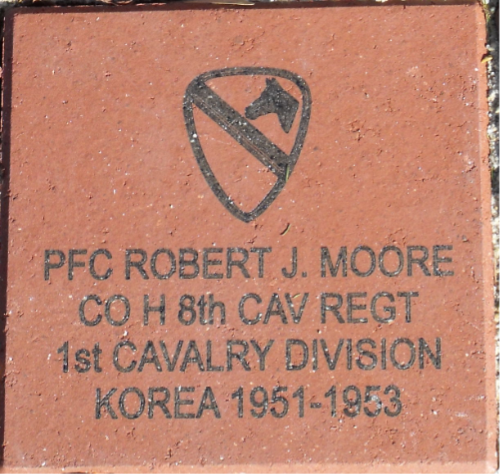 With your purchase of a brick you will receive an 8 1/2" X 11" certificate, suitable for framing, to give to the honored military veteran or a member of Emergency Services. <>We also invite you to include a photo and a short biography of the honoree. The photos and biographies will be used to create an online catalogue of names on the Walk of Honor. Each honoree will have their own web page (example). Honorees and their families are invited to send in any service related experiences, war or otherwise, that they would like to share. These experiences will be added to the "Service Stories" section of the web site. 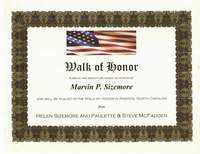 For genealogists, descendants and family members of the honoree, the Walk of Honor provides an opportunity to honor your ancestors or family members and share your family's personal story with the world. Walk of Honor, 183 Academy Heights Road, Kinston, NC 28504.